In the forested outskirts of town, chandeliers and velvet coexist comfortably with wood and stone inside this Harbor Springs log home. Sally Olson is fond of crystal chandeliers and bone china, Jay Olson loves things sleek and simple. “She’s Victorian; I’m concrete and modern windows,” Jay says. 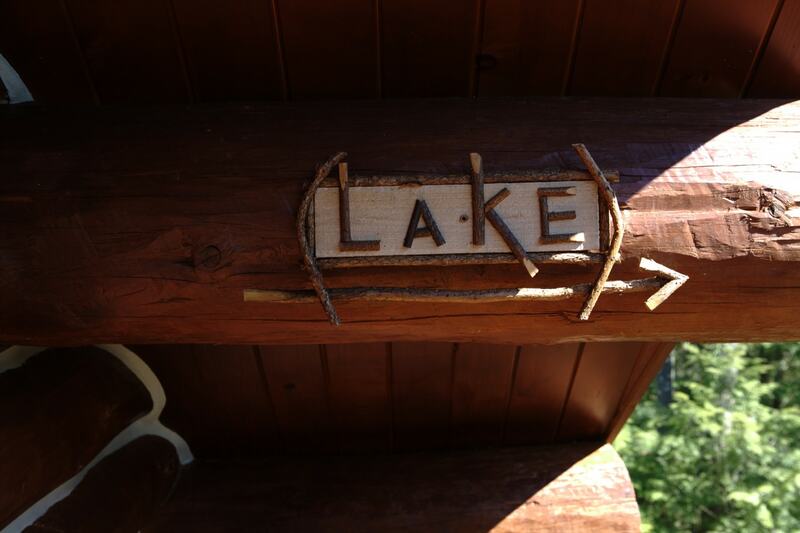 Happily, they both like the lodge look, and their log home north of Harbor Springs takes that style and makes it sing, creating a feel that hearkens back to a time when city folks retreated to rustic waterfront cabins for the summer with steamer trunks full of fancy accouterments. 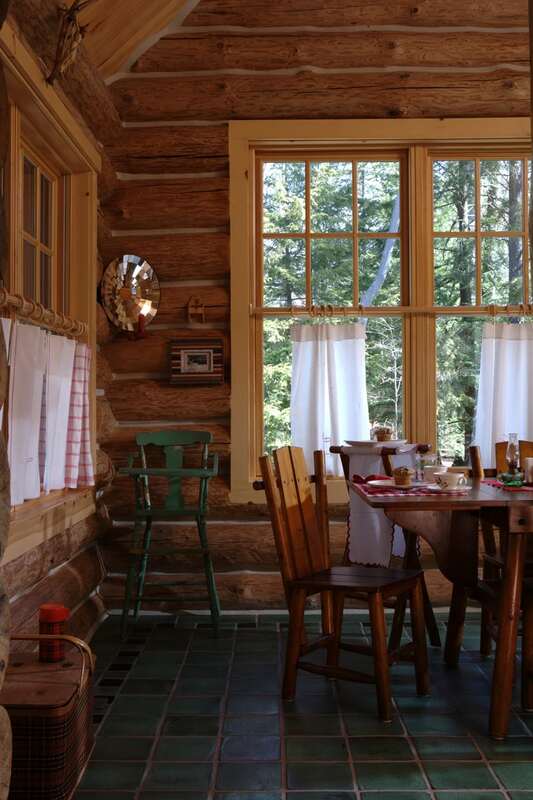 In the Olson home, animal mounts and silver tea trays live in harmony, and a formal dining room set—complete with bow-front buffet and glass-fronted corner cabinets—is the perfect accompaniment to rough-hewn log walls. 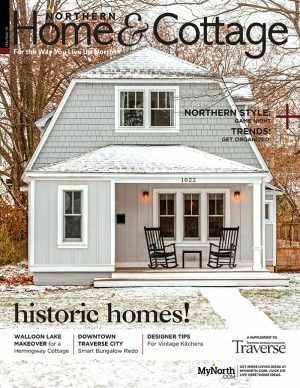 This story is featured in the April 2010 issue of Northern Home & Cottage. Read the latest issue online, free. Pull up under the one-and-a-half-story covered entrance and step up to the front door. Take off your shoes and feel the in-floor radiant heat that warms the foyer tile. Down the hallway to your right, the master suite is done up in lipstick red. A chandelier hangs above the ornate bed, and an 18th-century pine armoire nestles nicely against the chinked logs. 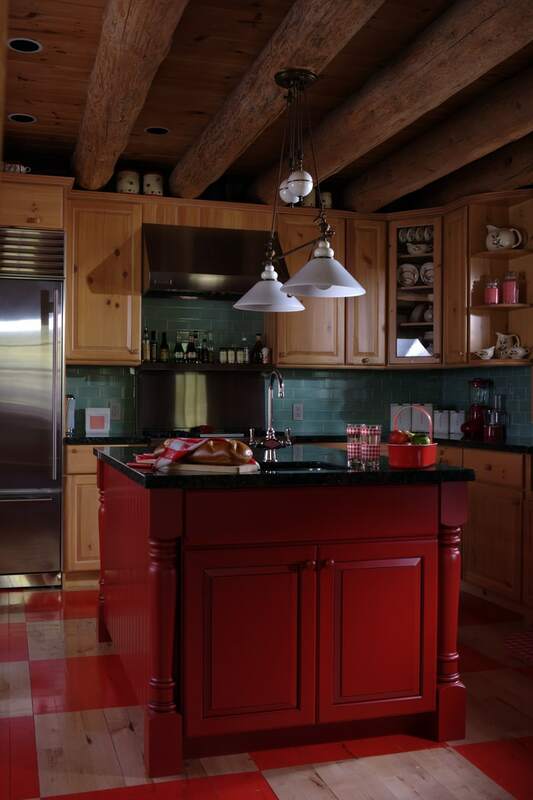 The other side of the foyer leads to the kitchen, where streamlined stainless appliances and a stainless farmhouse sink feel right at home with such countrified touches as a red beadboard island and a natural maple floor painted with big red squares. The natural-finish pine cabinets are enhanced by a backsplash of crackle-glazed subway tile in a classic 1930’s shade of green. That scheme plays off the furnishings in the private nook beyond, where the Olsons cozy up for breakfast over a rare Rittenhouse Butterfly table and chairs. Sally’s father’s ’30’s-era green highchair sits in one corner, and old Harbor Springs memorabilia add more visual treats. All of the curtains, adorned with pinecone, maple leaf and acorn themes, are made of antique fabrics. Moving into the formal 12-seat dining area, a sparkling chandelier hangs over the mahogany table, a long, velvet sleeve hiding the wire. The fixture’s light is amplified by the buffet’s grand mirror behind it. The couple’s late-40’s china fits right in: pinecones against a creamy background. 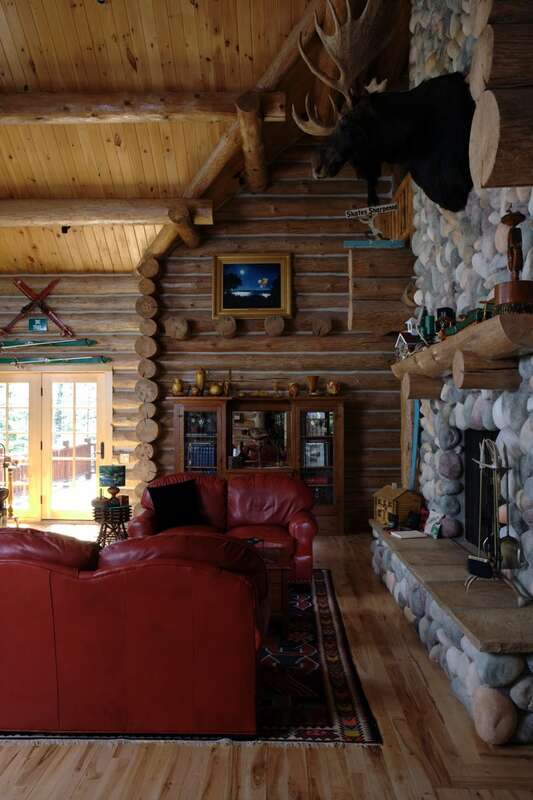 Beyond this is the great room, stunning with its red leather loveseats in front of the fireplace and a full-wall view of the heavily wooded forest and rolling creek, where the Olsons frequently spot eagles and most every other kind of Northern Michigan wildlife. A grand piano fills one corner, fitting for Sally’s Victorian soul. Club chairs, a rustic twig rocker from Suttons Bay artist Bill Perkins, and all kinds of vintage lodge-style visuals hang from the towering walls above. Jay’s collection of Roseville Pine Cone pottery sits atop a handsome cabinet with floral-patterned leaded-glass doors from the Arts and Crafts era, another style Jay embraces. Take the stairs to the top floor and find a feast of books and memorabilia from the 1930s and ’40s on the balcony overlooking the great room. It is soon to be turned into a game room. 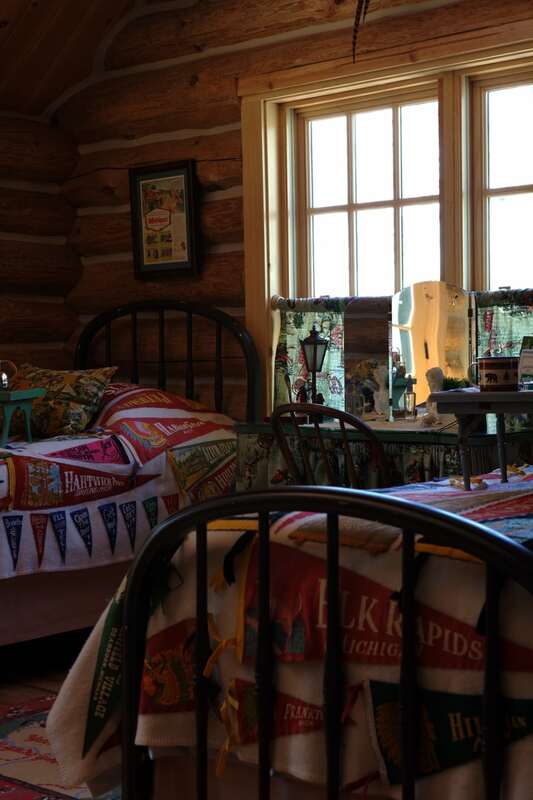 The guest room features twin iron-framed beds draped in linens with souvenir Michigan pennants. The adjacent office features a 1910 partner’s desk, with a computer on either side, where Jay works as a consultant for Autonomy Corp., and Sally, a surgical nurse, hunts for vintage goods. And then there’s Sally’s pièce de résistance, a stylish guest bathroom done in shimmering aqua with black-and-white floor tile, and metal and mirror-fronted cabinets popular from the 1930s through the ’50s. 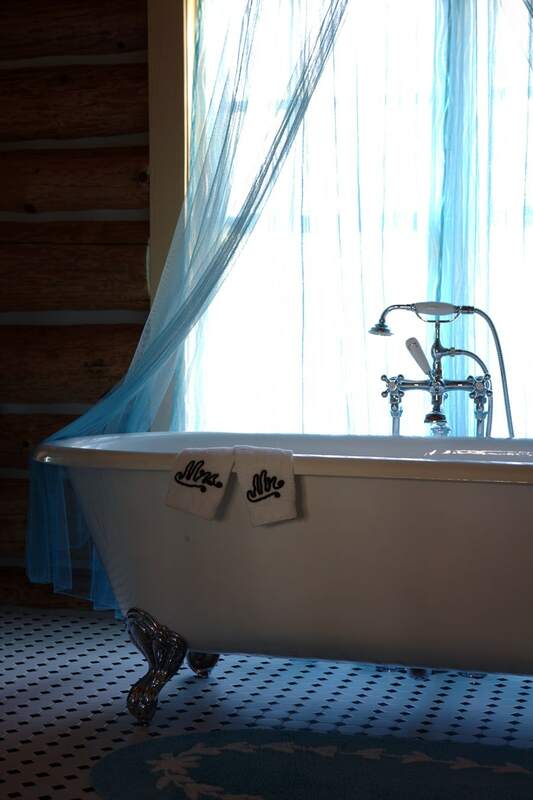 The centerpiece is an exquisite clawfoot tub, topped with a circle of diaphanous netting suspended from the ceiling. Sally tracked down many of her finds for the bath on eBay. But it was Jay, the fan of concrete, who found the treatment above Sally’s beloved tub at Pier One—and it’s definitely of the Victorian persuasion. “My softer side,” Jay admits, laughing. 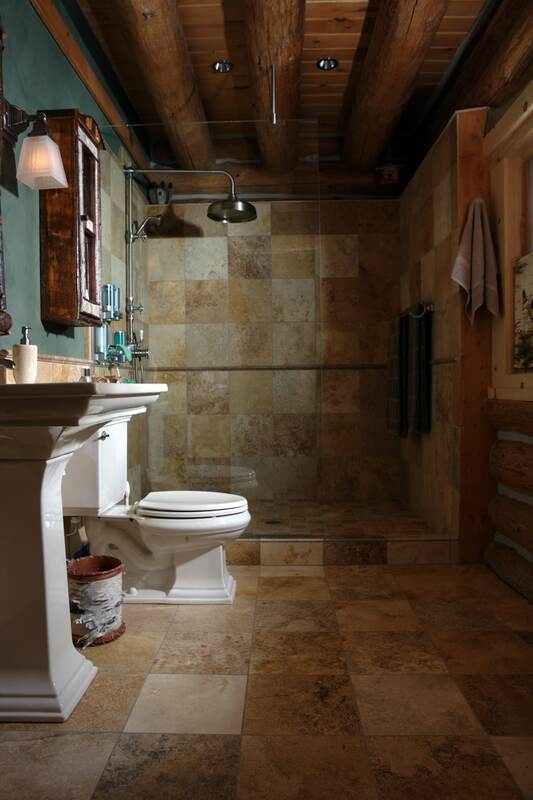 Besides, when the house is completely finished, he’ll be able to relax in his “man cave” that is taking shape in the lower level, where a TV, sound system, exercise room, sauna and, yes, a concrete floor, beckon.